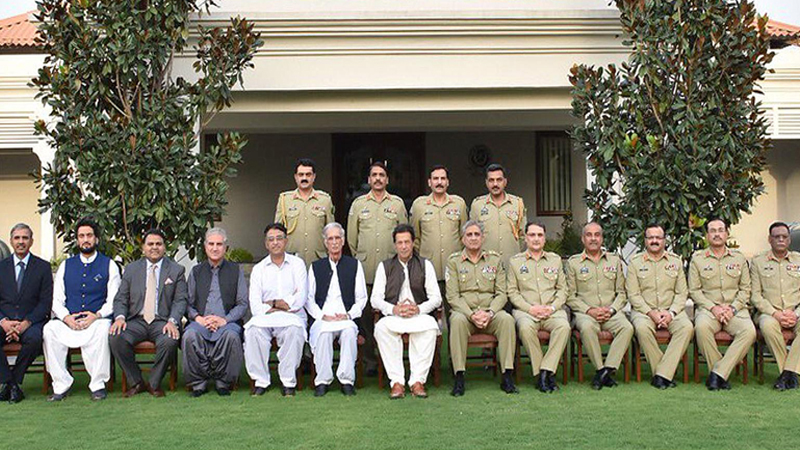 ISLAMABAD: Prime Minister Imran Khan Thursday pledged all-out support to Pakistan Army in dealing with the security challenges facing the country. “PM greatly appreciated professionalism, operational readiness and contributions and sacrifices of Pakistan Army in war against terrorism. He assured that government will provide all resources required to maintain capability and capacity of the army,” a statement issued by the Inter-Services Public Relations (ISPR) after a meeting between Prime Minister Imran Khan and Chief of Army Staff General Qamar Javed Bajwa at the General Headquarters (GHQ). The prime minister along with ministers of defence, foreign affairs, finance and information, state minister for interior and secretary defence visited the GHQ. Upon arrival, he was presented a guard of honour by a smartly turned out guard. The prime minister laid floral wreath at the Shuhada Monument to pay tribute to the martyrs. Later, the prime minister and the ministers were given detailed briefings on security environment, threat spectrum and response. Updates on Pakistan Army’s campaign against terrorism, ongoing operation Raddul Fassad, Karachi situation and Khushhal Balochistan programme were also shared. The army chief thanked the prime minister for visiting the GHQ and reposing confidence in the army. He assured the prime minister that Pakistan Army will continue to deliver as per nation’s expectations regarding defending the motherland at all costs. This was Prime Minister Imran Khan’s first visit to the GHQ after assuming the office. The visit follows Imran Khan and Gen Bajwa’s first-ever official interaction as chief executive and army chief on Monday at the Prime Minister’s Office. A statement following their meeting had stated that the two leaders had pledged to work closely for establishment of peace in the country and the region. Published in Daily Times, August 31st 2018.